More questions you may have about Filtrete Filters and your home's air quality? How do Filtrete Filters help clean the air in my home? How often do i need to change Filtrete Filters? What are the differences between the different Filtrete Filters? Is filter frame strength important? 99% of the particles in your air consist of very small particles one micron and smaller (a human hair is 40-50 microns in diameter!). These airborne micro particles (including fine dust, smoke and bacteria) can aggravate your allergies, irritate your respiratory system or simply make your home dusty and dirty. 3M developed the Microparticle Performance Rating (MPR) system to demonstrate a filter's ability to capture the smallest airborne particles-from 0.3 to 1 micron in size from the air passing through the filter. The MPR system helps you compare Filtrete filters based on the level of air filtration you want. The higher the MPR, the better the filter's ability to capture particles from the air as it passes through the filter. MPR is different from MERV, the Minimum Efficiency Reporting Value. The MERV system measures a filter's ability to capture large particles. The MPR only takes into account the tiny microscopic particles between 0.3 and 1 microns. When your heat or air conditioning is on, or if you run your fan continuously, the air circulation in you home passes through your air filter. Filtrete Filters from 3M contain permanently electrostatically charged fibers that work like tiny magnets to attract and capture the micro particles in your air. 3M's high quality standards ensure consistent and reliable performance. The Filter Performance Rating is a relative measure of a filter's initial efficiency at capturing airborne particles less than 1 micron in size. The higher rating means better filtration efficiency because of more Filtrete™ fibers. Based on independent laboratory tests of leading brands. Fiberglass filters were originally developed to protect your furnace and/or air conditioning system's blower motor and equipment. They were not intended to improve your indoor air quality. Filtrete Filters do both! Filtrete Filters help improve your indoor air quality by attracting and capturing allergy-aggravating micro particles, as well as helping keep your furnace equipment clean. As the air in your home is continuously circulated through the filter, it gets cleaner and cleaner! Surprisingly, expensive washable/reusable filters are more similar to fiberglass filters in their ability to capture micro particles. See chart above. Filtrete Filtering material will not support the growth of bacteria, mold, mildew or fungi in normal use. No unnecessary chemicals have been added to this filter. The recommended change interval is 3 months. However, the effectiveness and life of the filter can vary and will depend on the individual conditions in your home. Unusually dirty duct work, construction work, furniture or drywall sanding, the number of pets, the presence of smokers and running the fan continuously are some of the things that can shorten the life of your filter. In these cases, change the filter more frequently. This filter is designed to operate appropriately in most residential furnaces and air conditioning systems. If your Filtrete Filter remains in use longer than 3 months, it may begin to restrict airflow or cause the system to malfunction due to its high efficiency filtering. It also could restrict airflow in some higher efficiency furnace/air conditioning systems. In this case, change the filter more frequently. Each of the Filtrete Filters provides a different level of filtration. We design filters to meet the different needs that consumers have. The Filtrete Micro Particle and Airborne Allergen Reduction Filter is our most efficient filter at reducing airborne micro particles and allergens in the air you breathe. The Filtrete High Performance Clean Air Filter is designed to provide cleaner air in you home. The Filtrete Dust Reduction Filter is made for consumers who want to reduce the amount of dust in their homes. Yes, it is important for a filter frame to withstand pressure created by air movement through the filter without bending or collapsing. If a frame bends, it can allow unfiltered air to bypass the filter, or if the filter frame collapses it can be drawn into the furnace fan. 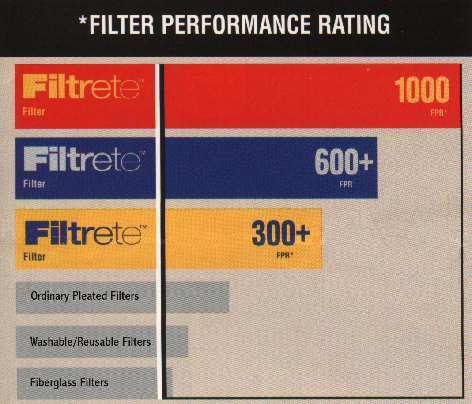 Filtrete Filters have consistent frame performance because they were designed to hold up even under severe conditions. "3M" and "Filtrete" are trademarks of 3M.